May it be the colorful balloons, the savory aroma of food or simply the good company of our family and friends, there’s just something about parties that make my heart happy. But before all the congratulatory hugs and kisses, the warm smiles and heartfelt laughter comes, PLANNING and – as we all know – BUDGET plays a great deal when throwing a party. 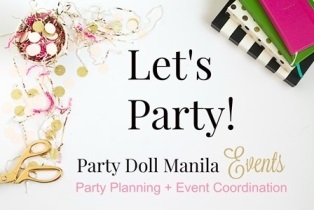 As a party planning mom and Party Concierge, I know how easy it is for us to get lost in the thrill and excitement of planning the perfect party for our little ones. It may seem harmless, but as one “small thing” adds up with another, you might be facing with the “after-party bill” shock. I don’t think that the idea of continuously worrying on what the grand total will look like or even the thought of being in debt after all the merriment settled down sounds thrilling to anyone. In order for us to avoid falling for the “overbudget” trap, here are some golden rules to keep in mind when it comes to determining your budget – Stay true to yourself, know your priorities, plan in advance, do your research and of course, stick to it. When the internet is a finger-tip away, getting ideas and inspirations for your party is as easy as 1-2-3. The thing is with all the lovely parties you see left and right, the urge to splurge will be harder to resist. So the question is, can we throw a fab party on a budget? Yes! I’ve gathered here 7 Smart Parent’s money-saving tips on how to overcome some of the biggest party budget-busters. SP money-saving tip: Know when to save and when to spend. List down all the details you want for the party and prioritize the ones that are important to you and your spouse. From there, indicate your budget and be sure to make it realistic. Remember, setting an unrealistic budget will only lead to frustration. The next column will serve as your actual party cost and include everything right down to the smallest detail like transportation or invitation envelopes. By laying it all down in one file, you can easily adjust your budget as you see fit and even get the grand total with just one click. Concentrate on your non-negotiable details first before anything else. Say bye-bye to “after-party bill” shock. Party budget-buster #2: Head count fiasco. SP money-saving tip: Make time to RSVP your guests. As boring and time-consuming as it may sound, this is one of the best ways to save money. Basically the number of your guests dictates the overall cost of your party. From food to prizes and giveaways, you can actually save tons of money by doing this. Besides, this is also a great way to remind your guests of your upcoming event. We all have our fair share of guests who likes to extend their invitations. These are the guests who love to bring a +1 or +2 without asking the party host. My suggestion is to indicate in your invitation the number of seats you have reserved for them. Nowadays, we also have to consider that our little guests also have their own +1s – their yaya. Be open in asking the parents if they will bring along their yaya with them. Party budget-buster #3: Food cost dilemma. SP money-saving tip: Choose quality over quantity. When you don’t have enough money to spare, there’s no need to sacrifice the quality of food. The key here is to aim for a well-balanced menu. One good example is to change the time of your party. Parties held during snack time (merienda cena) do not require a full-blown meal. Another way is to strategically choose your menu. If you think your guests are not into soups and salads, you can totally ditch it off the menu. Are you going to have your own dessert and candy buffet? Be sure to double-check the package/menu you have with your caterer and exclude their sweet treats offering. Party budget-buster #4: “Unique party” pitfall. SP money-saving tip: A little mix and match will do the trick. This is one of the frequently asked questions – how can my baby’s party be unique? Having a unique party means customized decorations all around, and this means extra spending. If you don’t want to splurge on the party decorations but still want your party to be different, I have the perfect solution for you. By combining 2 ready-made party themes into one, not only will your theme be different but you will also have a broader range of choices when it comes to buying souvenirs and prizes. Does your baby love Mickey Mouse? Why not throw a Mickey’s Circus party. Or does your daughter adore all things Hello Kitty but you secretly want to throw a shabby chic tea party? Then there’s Tea Party with Hello Kitty and Friends. SP Money-Saving tip: Get your creative juice flowing. Some of the prettiest parties I’ve seen are simple but were done with a lot of love. If you have a knack for DIY-ing, make your own party decorations. Not only will you save lots of money but you are also adding those precious personalized touch to the party, as well. Have an open communication with your suppliers. I’m sure they are more than willing to help you make your party a success. Another great way to keep those numbers down is to get a venue that complement with your theme. Who needs extensive party decors when your venue says it all? Are you planning a summer barbecue party? How about rent an outdoor venue complete with pool. Planning a mad science-themed party? Check out the cool museums around you. Aside from giving you the perfect atmosphere for your party, it’ll also provide your guests the perfect activities for the party. Party budget-buster #6: Exaggerated bargain hunters. SP Money-saving tip: Be smart on your purchases. I am a self-confessed bargain hunter. After all, why would you buy an item at its full price when you can buy it at half the price? Ask yourself 2 questions: “Will I let my children use these products?” and “Will these items be useful to my guest?” Over the years, I’ve learned a lot through experience. From buying crappy cheap stuff to choosing a more “unique” but useless party favors. While, yes, it may be cheap but when your guests throw the items away the moment they leave your party, it’s like they’re throwing your money away, too. SP Money-Saving tip: Be cautious and know the terms and conditions. When planning a big celebration, every cent counts. That’s why we look for ways to lower down the cost by scouting for different deals and promos. But behind all the price slashes lie some tricky terms & conditions. What I usually do when buying these deals is to call the merchant first and try to squeeze in a meeting or schedule for a taste-test. This way, I know what I will be expecting. Remember, you get what you pay for. Don’t be afraid to ask questions. After all, it is your money. Try checking with your coordinator their full service offering. You can save yourself the hassle of dealing with too many suppliers. Who knows? You might even score some discounts and freebies by getting everything from one reliable supplier. Through it all, I’ve learned that planning your party early and doing an intensive research helps. Ask for referrals because chances are your friends will not recommend suppliers if they’ve had bad experiences with them. And lastly, follow your instincts and enjoy party planning!